Our signature product. 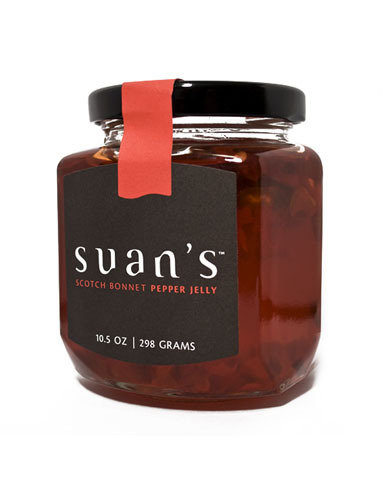 Customers exclaim this jelly is “sweet with a kick, a fine pepper jelly, and the best I have ever had!" The answer for scotch bonnet pepper lovers! Our flavoring sauce offers the unbridled heat of the scotch bonnet pepper. The flavor is distinctively rich and undeniably "scotch bonnet pepper"! This relish is crisp and crunchy with the freshness of just picked peppers. It is sweet, tangy and tart, making it a perfect pair with almost any food. This delicious jam is Suan’s mother’s recipe with a new twist. It is bold, spicy, and perfect when paired with beef, pork, breakfast burritos, pork loin chops with caramelized onions and all tomato-based dishes. 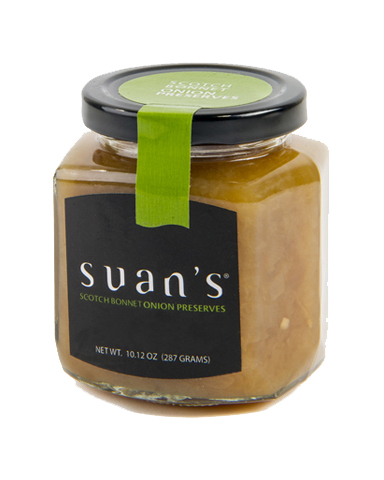 A fresh and tantalizing fruit butter with the tartness of the lemon, sweetness of the mango and the kick of the scotch bonnet pepper, which makes this a perfect accompaniment for everything from fish to cheesecakes! This jam has been described as a pineapple upside down cake in a jar! It's possibilities are endless: glaze ham, pork loin or lamb; its wonderful with cabbage rolls or stuffed peppers; use it as a topping for cheesecakes and ice cream. Caramelized onions without the wait. Our onion preserves have a hint of ginger and garlic and a touch of heat, and they are a staple in any food dish that uses caramelized onions.